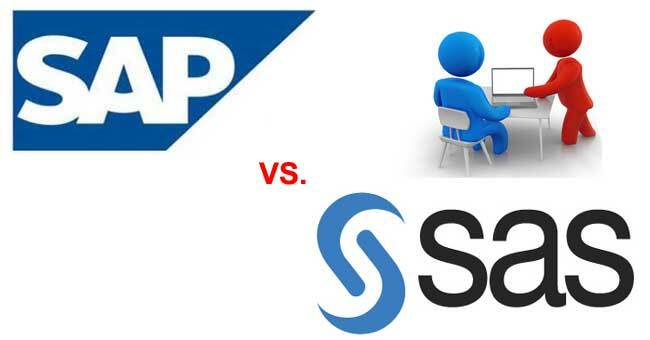 SAS Vs SAP Which is Best to Study? While there are some of the major differences between SAP and SAS, which have been listed below. While both are equally strong and offer an edge over each other, yet there are a couple of factors where either of them is stronger than the other. SAP is an (Enterprise Resource Planning, more commonly known as ERP. SAP is a German acronym which is spelt in English as “Systems, Applications and Products in data processing”. Statistical Analytical Solution or SAS provides complete and a comprehensive analytics including business intelligence and predictive analysis. SAS is equipped with a universal Inter-connect. Point to point topology which comes with a disk connection with scalable throughout. SAS is known to be a very flexible and an efficient way of leveraging increasing amounts of data. The SAP solutions are affordable in nature and are offered on-demand, easy to implement and maintain right from affordable on premise solution to on- demand monthly subscription, these solutions can be implemented in a few weeks time. SAS is not only efficient but is also know to have controlled costs to a great extent. Presentation Server-The presentation server is actually a program. It is usually installed on a user’s workstation. Application Server- This is a set of executables which collectively interpret the ABAP/4 programs and manage the input and output for them. Database Serve- This is set of executables that accept database requests from the application server. SAS comes with a well-crafted technical architecture. All the Information is consolidated and unified, which helps in further simplifying maintaining and accessing accurate data. The company launched SAP S/4HANA, the newest generation of the SAP Business Suite. This was written natively for the SAP HANA platform. Besides cloud, on-premises and hybrid deployment options to customers, the application also offers a much faster analytics, benefits including a smaller data footprint, higher throughput, faster analytics and access to data. This also facilitates existing SAP Business Suite customers to upgrade to this product from SAP Business Suite. SAS was originally designed for addressing the storage interconnect requirements of the enterprising computing environments. SAS has an inbuilt database technology, which is extremely flexible and is an efficient way of leveraging increasing quantity of data. It effectively uses the massively parallel processing or MPP architecture of the database or o the data warehouse for scalability and for a better performance. Infosys, Capgemini and Cognizant are some well-known organization using SAS.